There’s been a lot of recent hype about the Internet of Things and what it can offer manufacturing. Various research institutions and consultants have predicted incredible cost savings by harnessing this exciting new technology platform, which is considered essential to the creation of Industry 4.0, but is the hype justified? McKinsey estimate that factories will be the most profitable setting for the Internet of Things and that by 2025 the added value of this new platform could be $1.2 – 3.7 trillion dollars per year. The Internet of Things has inaugurated a whole new stage in manufacturing, Industry 4.0, and according to Forbes, new connectivity is predicted to change manufacturing as we know it. But is this really the case? The rise of connected devices in the consumer world has led to an increasing interest in technologies which can connect us more intimately with the physical world, from smart roads that can monitor congestion, to controlling your heating from your mobile phone, to cameras in your fridge so you can check which groceries you need from your phone! These ideas have captured the imaginations of consumers and in some ways contribute to our interest in what the future could hold in a world where our relationship with our surroundings has fundamentally shifted. It’s true that a lot of manufacturers are already taking advantage of the Internet of Things and Forrester Research predicted that 82% of companies will have some form of IoT applications implemented by 2017. 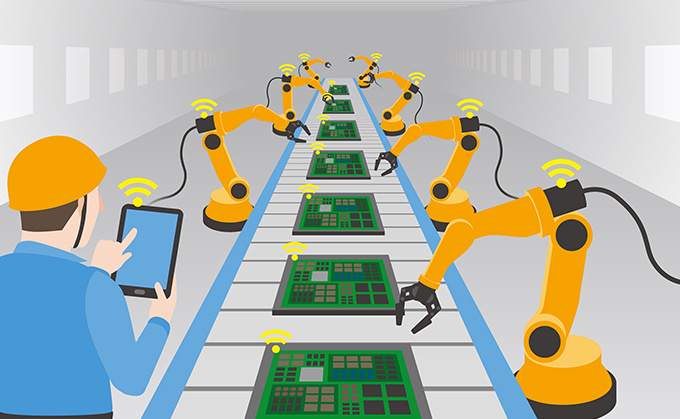 Automation and connectivity have been part of the factory environment for decades in the form of machine-to-machine (M2M) communication and predictive scheduling, so the idea of collecting data from machinery and getting equipment to communicate within the manufacturing industry is not as ground-breaking as it might appear. The difference when it comes to IoT is improving the interconnectivity so as to take maximum advantage of data that is produced, and at present, this isn’t always happening. There is more to Industry 4.0 than embedding sensors in equipment and tagging products with RFID. The data produced needs to be put through the right analytics software and applied to production, maintenance and logistics. For example, using sensors to predict wear or diagnose faults in equipment can help reduce maintenance costs by nearly 40%. If a sensor can predict a part has 16 hours left before breaking, the fault can be fixed before it happens. When factories can communicate more efficiently with external environments, suppliers, transportation and even the end-user, then the full capacity of the Internet of Things can be realised. The IoT is an open environment that extends beyond the factory floor, to distribution and after sales. ERP software is used to manage connectivity between different processes to achieve fluidity within the business, but this can be taken one step further to reap the financial benefits that McKinsey are talking about. There is probably a mine of transactional IoT data sitting with your ERP system just waiting to be analysed. Knowing where and how to apply this data however, is the stumbling block most manufacturers face. IoT allows manufacturers to analyse the performance of their products which in turn can make the user a more profitable company. Take an automotive manufacturer for example; through analysis of their vehicles they can tell a logistics firm which vehicles (and subsequently drivers) are least fuel efficient and allow for predictive maintenance to avoid downtime. Even if the fuel savings are only 5% and the maintenance is 40%, those figures over a fleet of vehicles over a year can add up to a huge saving. This is exactly what commercial vehicle manufacturer MAN are doing to widen their value chain and retain customers in a shrinking market. MAN are able to supply brand new vehicles to companies as a service rather than a product This gives MAN a steadier and more reliable source of income, improved customer retention and huge amounts of field tested data for the R&D team to work with. Their customer gets a fleet of brand new tractor units that will save them money on fuel and maintenance without the capital expenditure that would usually accompany a new fleet. Adding sensors and computational capacities to a product means a company can charge by usage rather than for total ownership and the customer improves efficiency and productivity. It’s a win-win! Like most manufacturing companies, long-standing K3 Syspro customer BKW Instruments, were already using a certain amount of interconnectivity via our SYSPRO ERP solution. The problem was they hadn’t started to use IoT to communicate with environments outside of the shopfloor, to help streamline their supply chain. Re-ordering stock was a manual process, without a restock trigger, meaning that items ran the risk of being ordered multiple times, or not at all. Our data connectivity product Dataswitch allows BKW to automate stock replenishment, so that a unique works order is raised to manufacture a specific item or part. Information flow is automatically passed to the correct departments to ensure that the stock arrives in the right place, at the right time, without waste. The time it takes to restock has been cut by 50% and the amount of paper used has been reduced dramatically. Most manufacturers are already familiar with the kind of efficiencies interconnectivity can offer on the factory floor. Better data and better communication between systems, machines and people should result in a much slicker supply chain, reducing wasted time and resources. Where the Internet of Things offers potentially revolutionary possibilities is in transforming what manufacturers can offer. Rather than being tied to a business model which sells products, manufacturers can add advanced services onto their products, to build greater customer loyalty, add value and yield higher returns. Manufacturers can experience a revolutionary shift to become an on-going service provider. This is an incredibly compelling reason to start harnessing IoT. A lot of it is already in place for the manufacturer, but taking it that one step further and using the most creative minds in your business to identify growth opportunities as a result of employing IoT strategically is essential in staying competitive.